Stolen Lives Induction Ceremony 2014 at St. Mary's Episcopal Church, Harlem. Photograph courtesy of Kathie Cheng. Cases of police brutality are increasing at an alarming rate. But how often do we hear the stories of the victims and their loved ones? For the past ten years, Fay Chiang has been paying tribute to the victims by painting their portraits. 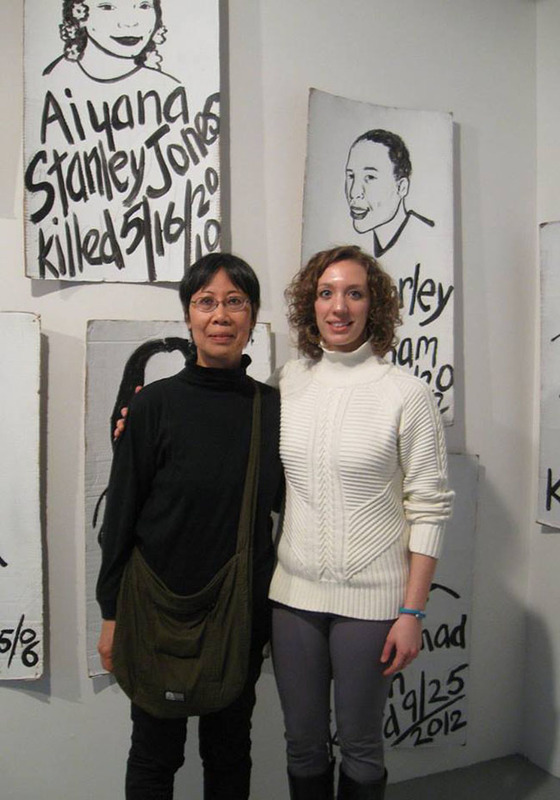 Chiang and EFA Project Space welcome Kathie Cheng, coordinator of the Stolen Lives Project, along with Iris Baez, Hawa Bah, Nicholas Heyward Sr., Margarita Rosario, Andree Smith, and Juanita Young—whose sons were killed by police—to share the Stolen Lives Project and some of their stories. The mission of the Stolen Lives Project is to assemble a national list of people killed by law enforcement agents from 1990 to the present. Through grassroots efforts, over 2000 cases were documented in the second edition of the Stolen Lives book, which was published in 1999. Although just the tip of the iceberg, these 2000+ are evidence of a horrifying national epidemic of police brutality. The victims of police violence were part of our society, but rarely are their lives or names publicized, or the real circumstances surrounding their deaths investigated and made known. The Stolen Lives Project aims to restore some dignity to the lives lost. Though their lives have been stolen from us, we will not allow them to be forgotten. Chiang is a 2014-15 SHIFT resident, Director of Programs and Development at Project Reach, and a member of Stolen Lives Project and other socially engaged organizations. This event is respectfully organized in conjunction with the exhibition Double Visions on view February 26 - March 28, 2015. For more information, please click here or email projectspace@efanyc.org.